Before I go deeper into the hoax I will describe the postmodern intellectualism in a more broad sense. My intention is also to show where the pseudoscience within New Age is coming from, especially the abuse of quantum mechanics. The Postmodern Intellectualism is characterized by relativism. You can talk about a collective relativism (cultural relativism), and an individual relativism (subjectivism). These two kinds of relativism are often in opposition to each other, due to different politicial views, as for example socialism contra liberalism. But I see them both as part of the same Postmodern Intellectualism. Relativism shows in an ingenious way, which no ideology have shown before – and therefore we don´t recognize it. Through schools, folk high schools, universities (especially in the Humanities and the social Sciences), continuing education and business communities – relativism has brainwashed most people to consider conceptions such as good and evil, true and false, beautiful and ugly, as something we have created ourselves, and which therefore don´t exist objective seen. Therefore they are rejected as premodern superstition, as an expression of old-thinking. Because if truth is something we have created ourselves, then there isn´t any objective criterium to decide what is true. All ideas are therefore equal true, and therefore anything goes. Relativism shows itself in different forms: subjectivism, social constructivism, pragmatism, nihilism, postmodernism. It is a mishmash of trendy ideas – deconstructive literary theory, New Age fantasies, so-called feminist epistemology, extreme social constructivist philosophy of science, even Lacanian psychoanalysis, humanistic psychology, experiential psychotherapy, coaching and management theory. And the books and articles written by these people, are also a mishmash of thought distortions, obscure jargon, political ideology, religious preaching and pseudoscientifical blather. Through this we have reached the highest level of postmodern development for better or for worse. The same fully individualized core of personality, which makes us able to step out of the past´s fixed and subconscious attachment, has itself become our main interest, center for our identity in a degree, that almost all our awareness are directed inwards in a global seen exceptional narcissism. Relativism has in this way succeeded in creating an illusion of, that it is a kind of sacrilege (intolerance/thought-crime/old-thinking) wanting to utter yourself about, what is good and evil, true and false, beautiful and ugly, at the same time as the relativists does this themselves in all possible quibbling ways, under cover of concepts such as tolerance or new-thinking. That relativism is an ideology shows in, that it is a closed system, which is shared by a large group of people – (though these people can disagree in between whether they are subjectivists (individual oriented relativists) or social constructivists (social oriented relativists), or if they are working in universities, or as coaches within the New Age environment, etc, etc). Such a closed system has especially two distinctive characters: 1) It allows no imaginable circumstance to talk against the ideology. 2) It refuses all critique by analyzing the motives in the critique in concepts, which is collected from the ideology itself (an ideology always thinks black and white, and therefore always has an anti-ideology, an enemy image, which it attribute on to everyone, who don´t agree). Relativism has in this way also succeeded in getting philosophy psychologized/spoiled. I have many times myself been surprised over, in what degree I have been attacked for my relativism-critique – attacks which apparently only directs itself against this, that I, with starting point in the wisdomtraditions, express the necessity of remembering the philosophical aspects of the spiritual work (the realization-work and the ethical practice). This is an absolutely necessity today, because the consequences of relativism will be the counter balancing of the Ego-unfolding. Now if you use philosophy, you will see, how truth escapes relativism – (because truth does exist objective seen; that is: not in the mind of Man, whether as an idea, an assumption, or a conception) – and returns to relativism as a kind of hubris-nemesis. 1) The argument of self-refutation. Relativism is logically fallacious, because it of course considers itself as being true. But it can precisely, in accordance with its own built-in relativism, not itself be regarded as more true than for example absolutism. For that reason it is followed by a long line of self-contradictions. All ideas, theories, assumptions and conceptions are of course relative. But relativism is itself a theory. The self-contradiction is that relativism makes an exception of its own position: the very assertion of relativism is itself nonrelativistic. It relates absolute to the relative, where the relative here is its own assertion of relativism. The art is of course to relativize oneself, and relate relative to the relative. And to do this you must also be able to relate absolute to the absolute, and acknowledge, that the absolute is an Otherness that transcends us, and therefore all our ideas, assumptions, theories etc., and which is the instance that carry us. The Otherness is the instance in reality, which makes it possible that we at all can investigate whether there is contradiction or coherence between our thoughts and our lived lifes. It is the instance that makes it possible to discriminate between awareness and inawareness; being yourself or trying to be something else. It is the order of nature, which puts us in order. It is not us who puts the nature in order. 2) The reductio ad absurdum argument. If you preach relativism and believe, that everything is relative and for that reason equal true, you have thereby accepted, that nazism, fascism, dictatorship, popular murder, terror and violence, are as equally great blessings for mankind as democracy, negotiation and dialogue (it is a fact that many totalitarian ideologies, paradoxically enough, today have begun to use relativism as justification for their business). Then you have no basis in order to criticize, because you haven´t got any rational frame to start from. You can´t criticize anyone for argumentation bungling, or to replace arguments with machine guns, because this presupposes, that there is a rational foundation in your arguments. How far out in the absurd will a relativist in other words defend his so-called “tolerance”? What about the child, which has been raped and murdered? Will the relativist go in and defend the murderer against the critique, and say, that it might well be, that we are opposed to the murderer, but basically we can´t know, whether it is us who are mistaken, and him who is right? This there actually are examples on. There are moreover examples on, that relativists have defended religious mass suicide, female circumcision, wife burning etc., etc. So you can yourself figure out, what the ideology can be used to justify. The relativists´ idea of themselves as being mediators are in other words absurd and self-contradictory – go to an Islamic and Jewish fundamentalist – and create peace by telling them, that their faith after all only is something relatively? It is offensive, to hear this forbearing accent: “It is fine, that you have your viewpoints, but basically there is nothing which is true, so therefore make peace!” (Besides an extremely metaphysical statement, which claims itself to have practically divine insight in truth). If you observe the built-in energylaws of life, then the collective Ego-unfolding is an expression of energy, which has swung out in its one extremity. With necessity the energy will swing over in the opposite extreme. And this won’t happen in a quiet way, when you consider the enormous momentum that is in the actual extreme, and it will happen quite simply: through pollution of the environment, through diseases (aids, cancer and else) through warfare, terror, crises, inner mass psychotic collapses, and through natural disasters. This is what we very probably will have to face, because the rejection of the realization-work and the ethical practice is exactly what is needed for an ideology to keep its citizens in ignorance, and through ignorance to use them as means for reaching its goals; that is: using them in ways that don´t have to take ethics into consideration. These things were what George Orwell mirrored in his novel 1984, and what he therefore warns us against. But the defenders of relativism refuse the above-mentioned classical arguments against them, because they see it as old thinking. However the Sokal Hoax has exposed relativism in a nearly comical way. The phrases old-thinking and new-thinking are very popular within the so-called postmodern intellectualism, which is the background for what I consider as a wrong spiritual turn within the more popular, common movement of New Age. In this movement I for example have heard people refer to themselves as New Thought Ministers (see my articles Six common traits of New Age that distort spirituality and The New Thought movement and the law of attraction). Though the postmodern intellectualism and New Age would disagree in between, they are both a sign of what I call the Illuminati-aspect the Matrix Conspiracy (see my article The Matrix Conspiracy). My concept of Illuminati is based on the rise of pseudoscience. There are especially two kinds of pseudoscience: 1) the pseudoscience of New Age, which demands that science has to be integrated with “alternative” sciences with spiritual content. 2) The pseudoscience of reductionism, which demands that science has to be integrated with (or is the same as) certain atheistic/political/postmodernistic views (see my article The pseudoscience of New Age and reductionism). Both are a part of The Matrix Conspiracy because they both support subjectivism and relativism, which are a fundamental philosophy of this ideology. 1) George Orwell´s novel 1984. Today, after having passed 1984, we live in a so-called postmodernistic dystopia, where eternal values such as goodness, truth and beauty fall more and more away – and where we have been invaded by the ideology of relativism, which rulers, in creeping ways, use the same phrases as the rulers in Orwell´s novel, as if they had used it as inspiration (the nearest to an attempt of actually creating a new language, which implies some rules about what is considered as “negative” and “positive”, is probably the creating of the so-called Giraffe-language – see my article Nonviolent Communication as an instrument of psychic terror). 1) The claim, that Einstein´s theories of relativity, and quantum mechanics, prove that relativism and subjectivism are valid points of views. 2) The claim, that Quantum mechanics, and Einstein´s theories of relativity, prove that classical physics (the age of enlightenment, rationality, objectivity) is not valid anymore. And, in short: relativistic theories are actually themselves using classical physics to explain their own theories (for example by the help of the causality-principle), and that is precisely what quantum mechanics breaks with (read more about this in my article Quantum mechanics and the philosophy of Niels Bohr). But the use of the concept of paradigm shifts is very popular in the postmodern intellectualism and its more common spiritual movement New Age, where a lot of different “spiritual” systems (new-thinking), often contradictory, are claiming, that it from now on is impossible to think in “old” ways anymore, without accepting their systems. The failure is due to their constructivistic ways of thinking; that is: relativism. Also of interest are the grand claims about themselves, which make you ask: what is it in these peoples´ thoughts and theories that make them so great? Nothing. It is the Emperor´s New Clothes: the thought, that if you just tell the story, then it probably will become true through some kind of magic. In the autumn of 1994 Alan Sokal submitted an essay to Social Text, the leading journal in the field of cultural studies. Entitled “Trangressing the Boundaries: Towards a Transformative Hermeneutics of Quantum Gravity,” it purported to be a scholarly article about the “postmodern” philosophical and political implications of twentieth-century physical theories. After review by five members of Social Text´s board, Sokal´s parody was accepted for publication as a serious piece of scholarship. It appeared in April 1996 in a special double “Science Wars” issue of the journal devoted to rebutting the charge that cultural studies critiques of science tend to be riddled with incompetence. At that time, the journal did not practice academic peer review and did not submit the article for outside review by a physicist. On its date of publication (May 1996), Sokal revealed in the journal Lingua Franca that the article was a hoax, identifying it as “a pastiche of Left-wing cant, fawning references, grandiose quotations, and outright nonsense...structured around the silliest quotations (by postmodern academics) he could find about mathematics and physics”. The article was stiched together so as to look good and to flatter the ideological preconceptions of the editors. Sokal´s hoax is today acquring the status of a classic succés de scandale, with extensive press coverage in the United States and, to a growing extent, in Europe and Latin America. The Sokal Hoax shows three important things. First, that dubiously coherent relativistic views about the concepts of truth and evidence really have gained wide acceptance in the contemporary academy, just as it often seemed. Second, that this onset of relativism has had precisely the sorts of pernicious consequence for standards of scholarship and intellectual responsibility that one would expect it to have. Finally, that neither of the preceding two claims need reflect a particular political point of view, least of all a conservative one. In an interview on the NPR program All Things Considered, Sokal said he was inspired to submit the hoax article after reading Higher Superstition: The Left and Its Quarrels With Science (1994), by Paul R. Gross and Norman Levitt. In their book, Gross and Levitt reported an anti-intellectual trend in university liberal arts departments (especially English departments) which had caused them to become dominated by a “trendy” branch of post-modernist deconstructionism. After analyzing essays from “the academic left”, scientists argued that some of these critical writers were ignorant of the original scientific documents they were criticizing and, therefore, were making a series of nonsensical statements about the nature and intent of science. Gross and Levitt found it especially troubling that academic journals were not judging the intellectual integrity of the scholarship through peer review but were merely judging papers according to their political tilt. Higher Superstition argued that for an article to be published in some academic journals, especially those associated with the humanities, it needed only to display “the proper leftist thought” and to be written by – or to quote – well-known leftist authors. Thus, Higher Superstition was an attempt to challenge purportedly uncritical subjectivist thought, the validity of which otherwise went largely uncriticized. Moreover, the book served as an argument from scientists that the Science Wars were primarily fought by non-scientists who were pushing contentious claims about the dubiousness of scientific objectivity. Sokal reasoned that, if the presumption of editorial laziness were correct, the nonsensical content of his article would be irrelevant to whether the editors would publish it. What would matter would be ideological obsequiousness, fawning references to deconstructionist writers, and sufficient quantities of feminist and socialist terminology (see my article The new feminism and the philosophy of women´s magazines). It is impossible to do justice to the egregiousness of Sokal´s essay without making account of some common themes that you find in almost all publications of relativism, no matter of the disagreements they might have in between; that is: what makes relativism into an ideology shared by the enormous group of people that call themselves relativists. 2) They typically assert that this “dogma” has already been thoroughly undermined by the theories of general relativity and quantum mechanics and that physical reality has been shown to be “at bottom a social and linguistic construct.” In support of this, they adduce nothing more than a couple of pronouncements from physicists as for example Niels Bohr and Werner Heisenberg, pronouncements that have been shown to be naive by discussions in the philosophy of science over the past 50 years (see my articles Quantum mysticism and its web of lies, and Quantum mechanics and the philosophy of Niels Bohr). 3) They then typically pick up steam, moving (jumping) to one of their central theses. According to where they belong within the wildgrowing theories of relativism, they have many different central theses (within New Age one of the more popular is New Thought and the law of attraction). But let us take one of the theses from The Postmodern Intellectualism, for example where they move to the thesis, that recent developments in quantum gravity – an emerging and still-speculative physical theory – go much further, substantiating not only postmodern denials of the objectivity of truth but also the beginnings of a kind of physics that would be genuinely “liberatory”, of real service to progressive (and also right-wing depending on where they belong) political causes. And here the “reasoning” becomes truly venturesome, as they contrive to generate political and cultural conclusions from the physics of the very, very small (in New Age it is typical “spiritual” conclusions). 4) Their inferences are typically mediated by nothing more than a hazy patchwork of puns (especially on the words linear and discontinous), strained analogies, bald assertions, and what can be described only as non sequitors of numbing grossness (to use a phrase that Peter Strawson applied to the far less culpable Immanuel Kant). For example, they move immediately from Bohr´s observation that in quantum mechanics “a complete elucidiation of one and the same object may require diverse points of view” to imply, that in such a situation, how can a self-perpetuting secular priesthood of credentialed “scientists” purport to maintain a monopoly on the production of scientific knowledge! The content and methodology of postmodern “science” thus provide powerful intellectual support for the progressive (or Capitalistic, if they belong there) political project, understood in its broadest sense: the transgressing of boundaries, the breaking down of barriers, the radical democratization of all aspects of social, economic, political and cultural life. So the works of these people are often breathtaking in their combination of self-confidence and absurdity. What Robbins and Co. Should have said, is that Social Text is a political magazine in a deeper and more radical sense: under appropriate circumstance, it is prepared to let agreement with its ideological orientation trump every other criterion for publication, including something as basic as sheer intelligibility. The prospect of being able to display in their pages a natural scientist – a physicist, no less-throwing the full weight of his authority behind their cause was compelling enough for them to overlook the fact that they didn´t have much of a clue to exactly what sort of support they were being offered (if you change the word political with the word spiritual, then you see, that the precise same is happening in New Age circles and in New Age magazines). And this is what is at heart of the issue raised by Sokal´s Hoax: not the mere incompetence in the academy, but rather that specific form of it that arises from allowing ideological criteria to displace standards of scholarship so completely that not even considerations of intelligibility are seen as relevant to an argument´s acceptability. How, given the recent and sorry story of ideologically motivated conceptions of knowledge – Lysenkoism in Stalin´s Soviet Union, for example, or Nazi critiques of “Jewish science” – could it again have become acceptable to behave in this way? But it is not only in Social Text you see this. You see it practically everywhere in schools, folk high schools, universities, continuing education and business communities. You are therefore forced to accept it, in order to be able to work and live in our society of today. The most grotesque form though, is within the theory of New Thought (see my article The New Thought movement and the law of attraction). Here you see coaches/gurus in silk suits earn millions of money on repeatedly abusing scientific ideas totally out of context, without giving the slightest justification – or throwing around scientific jargon in front of their non-scientist audiences and readers without any regard for its relevance or even its meaning – and mixing it with spiritual concepts (also totally out of context, and therefore abusing) in order to give their work some kind of “holy” meaning (see my article The pseudoscience of New Age and reductionism). The Sokal Hoax can serve as a flash point for a necessary gathering storm of protest against the collapse in standards of scholarship and intellectual responsibility that vast sectors of the humanities and social sciences are currently afflicted with, and which therefore also is spreading without the universities. As mentioned, I have myself been attacked by these people in very, very insulting ways, when I have shown my critical view on all this. I have especially been surprised over the reactions coming from people in the New Age invironment (especially from advocates of New Thought), who, in other contexts, almost is shouting about how big their love is (read more in my article The Hermeneutics of Suspicion (the thought police of the self-help industry) and why I am an apostle of loafing). And, it is always the same way these people react on critique, like if you turned a tape-recorder on. They always use the thought distortion Ad hominem move, no doubt because of the psychologizing aspects of their teachings (see my book A dictionary of thought distortions). Also Alan Sokal was attacked in these ways. 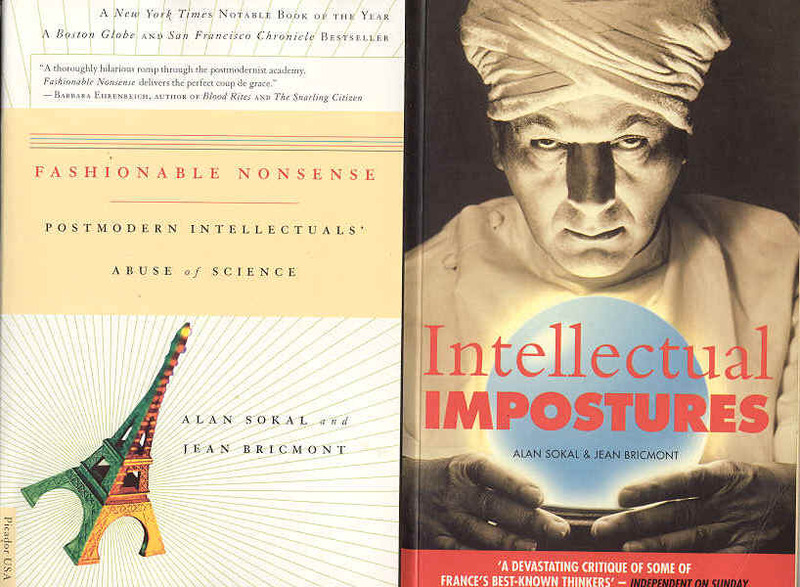 After having revealed his Hoax he wrote a book Intellectual Impostures, together with Jean Brichmont, where he examined the canon of French postmodernists – Lacan, Kristeva, Baudrillard, Irigaray, Latour, Virilio, Deleuze and Guattari – and systematically (with the use of objective argumentation) exposed their abuse of science. In the book he also writes about the reactions of the relativists. As I have mentioned, then George Orwell´s novel 1984 seems to be a possible inspiration for these people. Alan Sokal mentions Schopenhauer´s The Art of Always Being Right: namely, enlarge your opponent´s target so as to make him look ridiculous. The relativists support the use of rhetoric, manipulation and even lies in order to force their message through, because, according to them, it is not facts, but the best story, which wins (they have actually written books about this). Relativism justifies it. Anything goes (there is a tendency to that objective dialogue more and more is being replaced by a subjective, coarse debate culture). Sokal describes the reactions in the following way, which I will repeat below, because the insults are very semilar to the insults I have experienced.